The Thickness Probe module provides a way to sample two edges and determine the maximum, average or minimum distance between the detected edges. This is essentially relates to the thickness of an object. 1. Current Image - move the probe graphic to the location which you want to probe for lines. 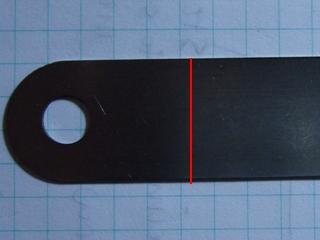 You drag the red square to move the entire probe or move each of the corners to change the shape and size of the probe. Note that the arrow dictates the search direction and should always be perpendicular to the edge being detected. You can also move each endpoint individually by changing the coordinates using the text boxes below in the Coordinates area. Use CTRL-click to move the entire probe to a different location. Use SHIFT-drag to create the probe of a certain size in the clicked position. When zoomed in, drag the image around to view different parts of the image or expand the dialog window to view more of the image. 2. Use Origin - You can specify that the current coordinates are relative to the Origin Variables created by the Origin Probe Module (or by setting these variables yourself). This allows the specified coordinates to move relative to the detected origin in case what you are sampling is not always in the same absolute image location. When you select this checkbox the current origin values are subtracted from the currently specified coordinates to create a relative position. If you have not yet set the origin, you can come back later and adjust the coordinates as appropriate. 3. Options Identify - select how many objects you want to measure. Note that if you select many objects to be identified you are not guaranteed to get that many objects depending on the thresholding information below. The "Identify" number specifies a maximal number of objects to detect. 4. Smooth Edge - to reduce noisy edges select the amount of smoothing that should be applied to the edge prior to edge detection. 5. Edge Threshold - to eliminate very weak edges from being detected as part of a object boundary select an appropriate edge threshold (0-255) that will remove edges whose edge intensity is below the threshold. Note that smoothing the edge will also reduce the edge intensity and thus the Edge Threshold will need to be adjusted after the smoothness is specified. 6. Relative Threshold - to only select those edges that are significant you can specify the relative threshold (0-100) that will remove successive edges that are the relative threshold percent less than the previous edge. For example, consider the highest 3 edge values as 130, 120 and 40. If the relative threshold is 50% then the last edge 40 would be eliminated since 40 is less than 50% of 120. As 120 is 92% of 130 it is not eliminated (unless the threshold where set at 95%). 7. Zoom - you can zoom the current image by selecting an appropriate zoom. This will allow you to better select the appropriate values with finer resolution. 8. Measure - select the appropriate measurement that you want to perform on the object. 9. Show Measurements - to visually see which span is detected (in the main RoboRealm interface) select the appropriate Color and Thickness of the circle that will indicate where in the image the maximum, average, minimum span have been detected. PROBED_THICKNESS_COUNT - the number of detected objects.